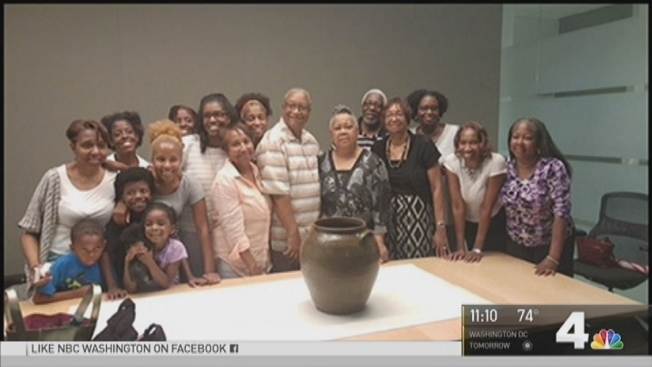 A local family found out they are the descendants of a man who was born a slave and created now-famous works of art -- one of which will go on display at the National Museum of African American History and Culture in D.C.
Daisy Whitner said it all started with a phone call she received from a genealogist in the spring. "I said, 'I'm on my feet now. You know a lot about my grandparents.' Who are you? You know, and she said, 'Well, I know a lot about your family.'" The genealogist invited Whitner and her family to Dave Day, a festival in South Carolina that honors a famous African American artist who had been born a slave. Known as Dave the Potter, Dave challenged anti-slave literacy laws by learning to read and write and he inscribed poems on the pots he made. Some of the surviving pots have sold for more than $100,000. It was at the festival that the family learned they are direct descendants of Dave. Back home, another member of the family, Wanda Holmes, arranged for them to view one of Dave's pots that is displayed at the Smithsonian's National Museum of American History. It was a powerful moment for them as they saw the work of a man who perservered after his family had been sold away from him. "You read books about slavery, but it was somebody else. But when it's your relation, then it becomes personal. It touches you here and you can't stop crying because you can feel their pain," said John Williams, relative of Dave the Potter. "Then you also feel the pride of him being able to accomplish, under those circumstances and you wonder if you could ever do that or if you could be that strong," said relative Pauline Williams Baker. Dave's pot is moving to the National Museum of African American History and Culture and will be there on Saturday for the museum's grand opening.